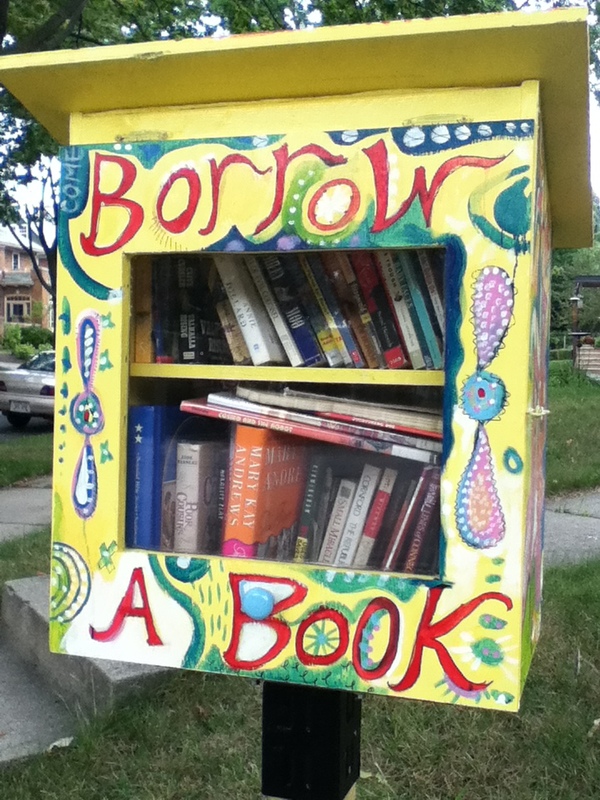 Have you heard of the “Little Free Library” yet? 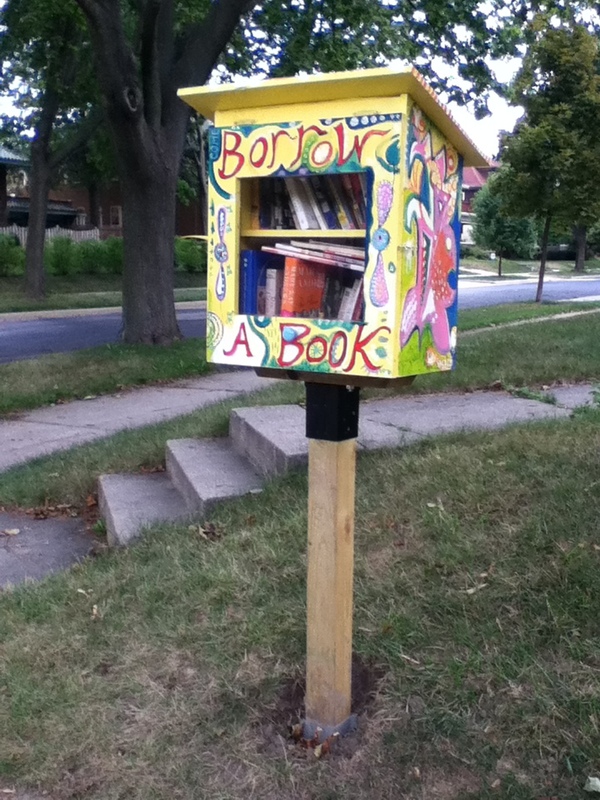 Boxes like birdhouses full of books are popping up in front yards around the metro Milwaukee area. My own neighborhood has several. What a nice idea this is . . . and how simple! A Little Free Library box is basically a weatherproof book cabinet on a post. You set in up in your front yard and put a few books inside that you’re finished with. Anyone walking by is invited to take any that look interesting, and people are encouraged, but not required, to pass along books that they’ve finished with to new readers. Any kind of book is okay – kids’ books, novels, cookbooks, how-to books, coffee-table books. People browsing or replenishing the stock often meet each other, and the Little Free Library becomes a neighborhood focal point and gathering spot of sorts. It’s not a replacement for the city library, but it has its own special place in readers’ lives. It may even serve to bring books to nonreaders, especially in poorer neighborhoods where trips to the larger library may be rare and bookstores don’t exist. Several articles have been written about the phenomenon, which was started by two men in Madison, Wisconsin, and has spread across America and into other countries. If you’d like to read more, the Little Free Library website contains links to several news stories in newspapers and television, including this USA Today article that details the project’s beginnings. If you’re handy, you can build your own Little Free Library with free plans from the website. Otherwise, you can order one in a variety of styles for a cost of $250 – $400. This entry was posted in Books and reading, Little Free Library, Milwaukee and tagged books, Little Free Library, reading. Bookmark the permalink. What a great thing to have in your community. Would love to have something like this where I live. Thank you so much for commenting! I hope it catches on everywhere. Another neat thing about this story is that one of the guys who started it did it to honor his mom. What a wonderful tribute! Wow that’s really great of him. I hope this does catch on elsewhere because it is such an amazing idea, great way to share the book love.